Are you ready to hunt walkers (zombies)?� You'd better be. This collar was inspired by the character "Daryl Dixon" from "The Walking Dead" (yes, we're huge fans). Do they get any more awesome than Daryl Dixon? Not really. With his crossbow, sweat, dirt, and incredible aim, who would NOT be inspired by all that badassery?? Everything "Zombie" is a guilty pleasure in our household, so it's only NATURAL that we would turn our inspiration into this creation. It is a 1.5" wide embroidered leather collar with your choice of color, inner and liner. ***Now offered in 2" width*** The bloody hand-prints, crossbows, and blood splatters were all custom digitized by us. The lettering has an awesome pattern fill that looks like running blood. It has the bonus of protecting the embroidery thread quite well. You'll get the option of brass or silver hardware. The product photo is made in an army green vinyl with brass hardware. 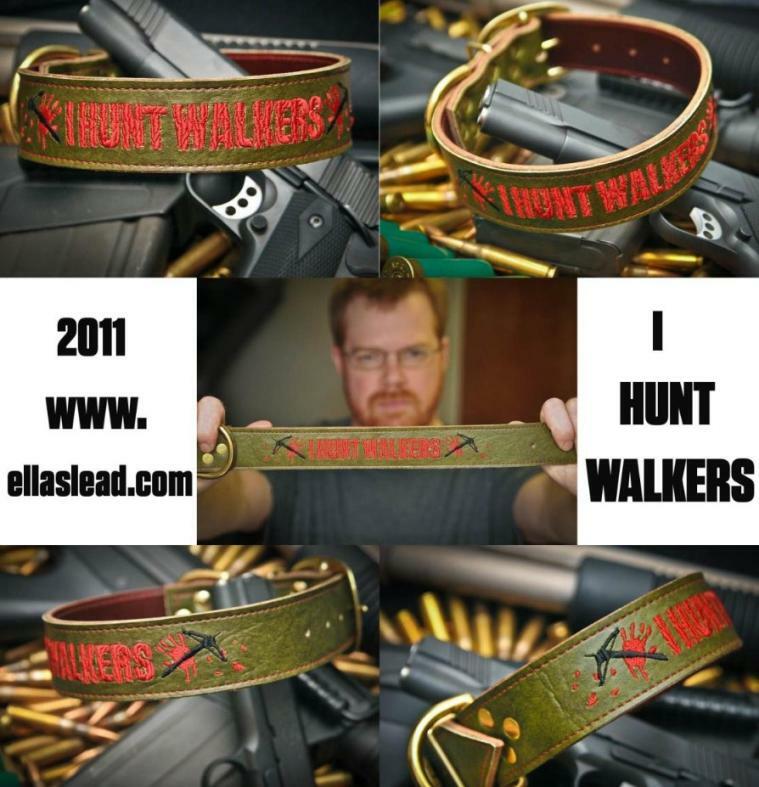 Please check out the links below to help you build your "I HUNT WALKERS" collar. Ella's Lead is not affiliated with AMC, The Walking Dead, Walking Dead (comic) or its producers.